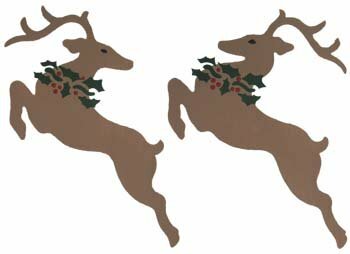 Join in on all the fun with these Christmas Stencils. The Holidays are the most wonderful time to get together with the ones you love. So, enjoy getting together with friends and family for some Christmas Art Projects. Don’t forget to get the kids involved too! What would Christmas be without Christmas Art Projects? Well, it might seem like the Grinch was here. Well, don’t fear. 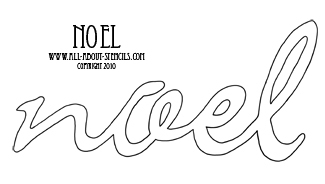 I’ve lined up many many Christmas Projects for you to enjoy and here are a few Free Christmas Stencils just for you! The first two Free Stencils are my windy trees. The first one reminds me of a Charlie Brown Christmas and the second one looks like it belongs in the Grinch’s house (after his heart grew three times in size of course). I want to you see this wonderful Christmas Craft Activities Project where I made Stockings to hang by the fire with these trees. They came out so cute and there is more you can do with them then display from the mantle. I like to use my stocking as gift bags. Well, you’ll read all about it! Don't miss the video down below. You'll see these stencils used to design tree skirts! Just right-click on the stencil and select print. Then cover the top of the paper with a clear protective cover like clear shelf liner before you cut out the pattern. This will preserve your stencil for many uses. Don’t know what to do with these Free Christmas Stencils? No problem! Just look around on this site and you’ll get loads of ideas. The first place to start is at Homemade Christmas Crafts where I show you how I painted Christmas Tree Stencil Designs and some others to decorate cloth napkins. By the way the trees are not these two. Yeah, that’s right you’ll find several more patterns of trees around here. I hope you enjoy all the fun ideas. I know I had a great time making all this up for you. Peace on Earth! 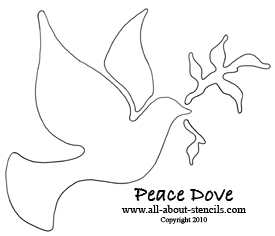 It’s what we all hope for at Christmas time and the Dove is the dearest symbol of this hope. I really want you to see how I cut this dove pattern from felt and glued it onto a 36” circle of red felt to make a beautiful Christmas Tree Skirt. You’ll find all the details at Christmas Art Craft along with a better explanation of the project details. Did you ever think about using stencils for other projects besides with paint? Stencils are simply patterns that can be used in so many ways. 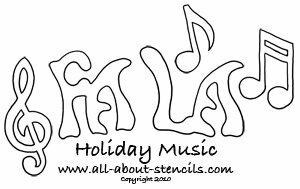 Just scroll down the list on the right for all of our other Christmas Projects and Free Christmas Stencils. 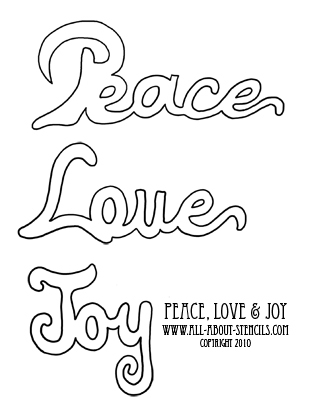 The next three Christmas Stencils are some words that we will find so familiar this time of year. I always like to mix images with words because it makes everything to much more personal. Wait! 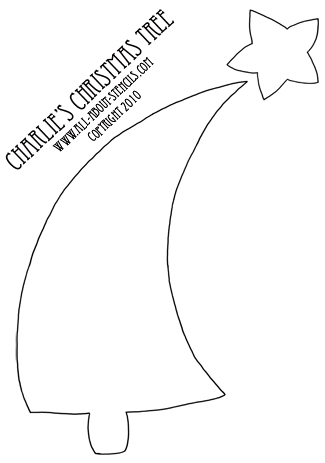 Don’t just print your Christmas stencils from this page and leave. You need to check out the Holiday Crafts Section for many fun projects. Children love doing arts and craft projects, but after a while, there’s no room left on the fridge to display their little masterpieces. But, the holidays offer a unique time because they can make gifts for the whole family that will be highly cherished. And what fun you will all have! Want more? 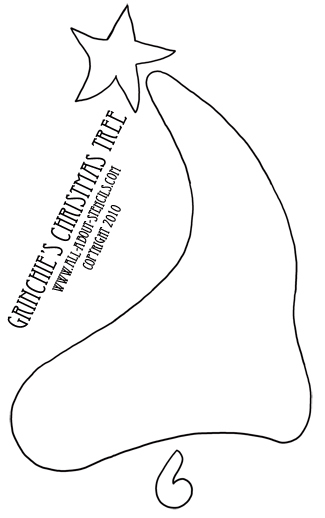 Then take a sleigh ride over to Printable Christmas Stencils for more free Holiday designs. You’ll save money by making homemade gifts, cards and decorations with these free Christmas tree stencil designs! These days everyone can use a little of this. But don’t feel guilty. A gift should never have a dollar obligation amount attached to it. It really is about what comes from the heart and a homemade gift shows that you took the time to make something special for a loved one and what is more valuable than your time. Besides with some great ideas you’ll be delivering gifts that everyone will enjoy! Another tid-bit about stencils: remember, open sections of a stencil are called islands. These are the areas that allow color to be applied on the surface under the stencil. Bridges are the stencil material that separates the islands and keeps the shape of a stencil. These areas block color or paint from reaching the surface. Looking for a stress buster? Well, creating Christmas Crafts Christmas Crafts is a great way to reduce stress for a couple of good reasons. First, if you make some great gifts and decorations, that’s less time in the stores and malls (and what’s more stressful than fighting the crowds and worrying about if what you bought is the perfect gift). Second, it’s very relaxing and enjoyable to create. Not to mention that you will feel uplifted and motivated to think about the nice gifts that you are making for the special people in your life. 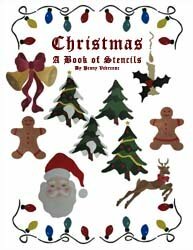 The books below are related to Christmas Stencils. Each book will come to you as a downloadable pdf file in your e-mail. Just check your e-mail after purchase for the link to connect to your file and print or save. It's that easy! Click on any of the book cover pictures for more Project Ideas! This collection of Christmas Stencils includes 9 designs. They are Santa Claus, a Reindeer, a Christmas Tree (with options for decorations), a Candle with Holly Accents, Bells with a Bow, a Gingerbread Boy and Girl, and a String of Lights. This purchase is of a PDF file which has 42 pages. Here’s a neat little book that I created for Christmas card making. The designs can be used as stencils or masks. You can use them to apply paint or cut out colored paper and paste. 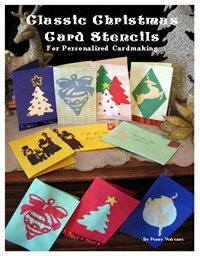 Stencils included are the Christmas tree and star, the reindeer, the ornament and bow and of course the carolers. Also, included is a pattern so that you can make matching envelopes. It has complete instructions and many ideas for creating a variety of cards. You will get your book right away because it's a pdf file. Look for an e-mail with the link to download the book right after purchase. Do you like the Reindeer Prints pictured here? They're very easy 2 overlay stencils in a down-loadable pdf file so that you can get your stencils right away (they will be e-mailed to you). Complete instructions included. Click on the picture for project ideas. This stencil book is not available in print. This collection includes 22 designs. Ten are easy single overlay. Six have 2 overlays and six have 3 overlays. 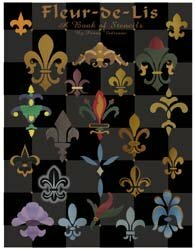 The Fleur de lis may not be what you typically would include in your Christmas Stencils but they do make a classic addition. Click on the picture to see the Christmas Tree Skirt made with one of these designs. Hey! Don’t forget that I (and everyone else) want to see what you have done with your Christmas Stencils. Just click on Stenciling Projects to get your masterpiece showcased here on this web site. Won’t that be exciting! Or if you have any questions or want to share information join in on the Stencil Blog. Well, I hope to hear from you soon. P.S. 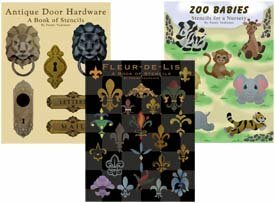 If you’d rather get your Stencil Pattern Books in Print, then visit our Printer’s Book Shop for the same designs in book format that will be mailed to you. You’ll find all of the stencils used as examples throughout this site. Oh wait! Here's that great video I promised you. Enjoy! Return to Holiday Crafts from Christmas Patterns and Stencils.